Radio stations are dying. It made sense when the FCC was divvying up the radio spectrum - assigning K??? call letter to stations west of the Mississippi and W??? for stations in the east - but the globalness of the net renders that notion as quaint as the typewriter. Increasingly we're learning that listeners don't care about the underlying station, but rather the material they broadcast. Pandora has removed the geographic station from the music experience and is crushing the FM music business. The other third of radio is programs - sports, news, public radio, etc and that's where I've been focusing. Radio has a massive library of programming from well known names to obscure cult topics, but there's been no way of easily finding and playing these shows. Manually browsing thousands of stations - all of which have a different layout and design - is impractical. 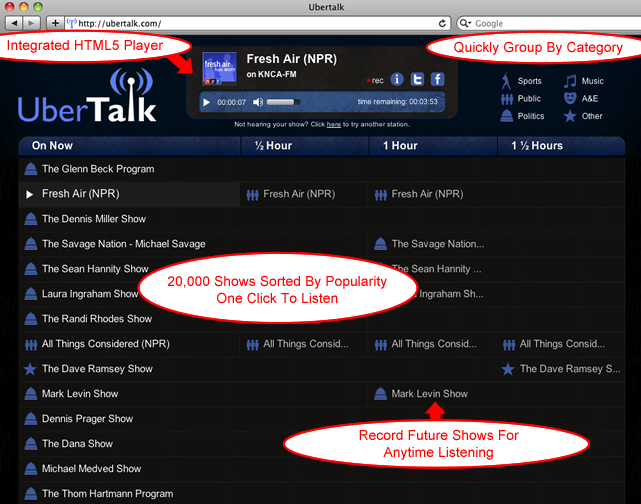 Enter UberTalk - a comprehensive list of programs on the radio, all of which you can play with a single click. 20,000 shows are ranked by listener popularity in a familiar TV-guide style layout with snappy category filters to list shows only on certain categories. Below is an annotated screenshot. UberTalk is designed to get the best of radio programming directly to your ears as fast as possible, so try it now and let me know what you think.